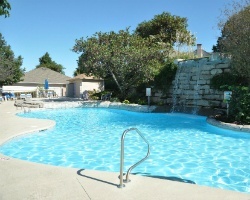 Great location near many outdoor activities for all ages! Week 46! Buyer may receive a title fee credit, inquire for details! *Westgate Branson Lakes at Emerald Pointe* is a beautiful property known as the 'Gem of Table Rock Lake'! The resort is nestled in the Ozark Mountains just minutes from the world-class entertainment and discount shopping opportunities of Branson, Missouri! Here you'll find all the elements that make up a perfect vacation, including sparkling lake views and a wide variety of water sports for the entire family such as boating, fishing, water-skiing, para-sailing or just relaxing in the warm waters on a sunny day. To discover more, visit www.westgateresorts.com. *RCI Affiliated / Interval International Select Resort* Featuring a finely appointed 2 bedroom, 2 bath lockout suite that will accommodate 8 guests comfortably. Usage is annual in week 46. For more information or to make an offer, please submit the inquiry form.